When I first saw this show was horror I was looking forward to watching it but I was also worried as it is a hard genre to do well and even more so in anime. I ended up watching all the episodes in one go and I am writing this right after finishing the final episode. Let me just say I am a huge fan of horror if its in books, movies or anime and it is pretty hard to scare me as I have watched horror for so long now. That said this show did manage to creep me out. I think it helps as every episode is only 3 minutes long so it does not keep you waiting ages for the reveal and it keeps you attention. Also using the internet, and electronics gives it more of a creepy feeling as they are things we all use all the time and in the show there is no real reason told to us why it is happening, it makes you feel as if what is happening to some of the people could happen to you. The show makes me think of telling stories around a campfire, they are short and scary, and it works. I really enjoyed this show, a lot more then I thought I would, and I really hope for a second series. When I first read a summary about this anime, I was pretty intrigued, never having seen or even heard of rotoscoping before. The fact that this technique was going to be used for a short horror anime sounded even better! I have to admit that I was pretty disappointed with the outcome though. I appreciated the experimental technique, but felt that the anime as a whole was lacking in direction and plot. At the very least, I thought they should've done a different story for each episode, but instead, it was essentially the same idea with different people. It became boring very quickly. I don't think this anime deserves a score lower than 3/10, simply because the technique was interesting and would probably appeal to fans of Japanese horror. I thought some of the other effects were a nice touch, such as glitching and static. I also enjoyed the small segment during the credits which shows the behind-the-scenes filming process. Overall, I wouldn't recommend this anime unless you're a big fan of Japanese horror and/or rotoscoping. Otherwise, don't waste your time. 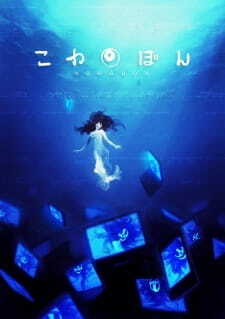 If you are looking for a short anime you can marathon in one night, you should take Kowabon into consideration. You can't only watch it in one night, you can watch all of it in one-episode-worth of time. Each episode is short, about 3 minutes. The people who were watching Kowabon while it was still running might have done the show wrong. I admit I did it wrong but not very much. It can be easily misunderstood because the story doesn't show clearly unless you watch all the episodes back to back. It's a horror story and I was going to say something but I's afraid it's kinda a spoiler. All I can say: heads up for cameras. It took me the whole series to realize what was going on. If you want to scare yourself a little, Kowabon can do that. One last piece of advice, do not watch the ending theme unless you want to see the actors behind the scenes. Many people complained about the ending, They said it kills the feeling the show leaves. You want to see what comes after the ending in episode 13 though. I gave it 6/10 and perhaps if the episode were longer, I would gave it more. It's not that amazing but it doesn't disappoint either. That's all for Kowabon. Please consider watching it and enjoy. It was really disappointing; there was pretty much no plot. I didn't understand anything. They didn't even wrap up the anime at all; the last episode was just another 3 minute-long episode. A lot of people were saying how it's not scary at all, but at some parts it really did scare me xD but there was no gore, no nothing. Just a few creepy/scary scenes. What pissed me off the most is that they never answered any of my questions. They don't say WHY there are these ghost things attacking people through technology. WHY they only appear in cameras and stuff. They don't. The only thing seriously good about this is the rotoscoping animation and the sound. But yeah. I didn't really like it.